What is the best free email marketing software solution for 2019? The best free email marketing software solution for 2019 is HubSpot Marketing. Coming from a reputable software provider, this solution integrates with your email and existing CMS and offers best-in-class contact segmentation to help you send targeted emails depending on different buyer personas. Furthermore, it has built-in analytics tools to help you monitor your conversions. This article has been updated with data on the 2019 list of free email marketing solutions to accurately represent the newest products in the niche. Email marketing software allows businesses to reach out to their target audience and build relationships with current and potential customers through one of the most time-tested channels. These software solutions allow you to deliver targeted messages effortlessly and distribute bulk messages, often on rule-based automation, freeing you from cumbersome tasks. Such tools are also designed to optimize your campaigns with analytics, so you can make data-driven decisions. What’s more, nowadays, having a limited budget is no longer a reason for you to shun email marketing. There are plenty of vendors that offer their products for free. But, of course, you know better than to simply choose any free application. So, we have screened the most reputable vendors and assessed the functionalities of their email marketing tool to make it easier for you to gauge which options are most suitable for you. By the end of 2022, there will be more than 4.3 billion email users around the world. That’s more than half of the entire world’s population. How is this relevant to your business? Hence, it’s not a surprise that email leads the marketing tools used by small businesses with 54%. It’s followed by tools such as the website and social media with 51% and 48%, respectively, as per Blue Corona. 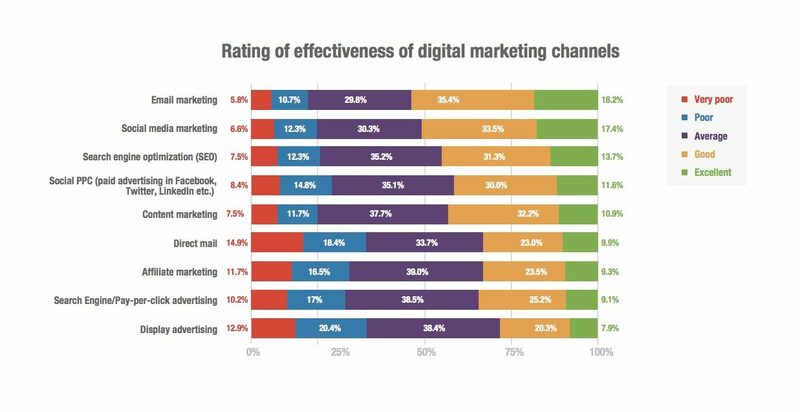 Furthermore, as you can see on the table provided, email marketing has been rated the most effective digital marketing channel, with social media marketing and SEO following closely behind. As an owner of a startup or small business, you may have a mail-merge spreadsheet as your version of an email marketing system. Since growth is crucial, your marketing demands grow as well. You will soon find yourself drowned in chaotic emails and overwhelmed with unsubscribe lists if you don’t invest in a full-fledged email marketing software. Luckily, if the budget is one of your main concerns, there are actually plenty of email marketing software programs you can use for free. They go beyond offering a free trial as they actually have plans that you can use without time limit and at no cost. Feature-wise, free email marketing software is at the lowest rung of most vendors’ price plans. You can check out this article on how much does email marketing automation software cost to see how it compares with paid subscriptions. Still, there’s a lot to be had with a free app in this niche, as you’ll discover below. Everyone loves freebies and from a business perspective, getting a particular service without charge can do wonders to your bottom line. However, it is important to note that opting for a free email marketing software comes with its own set of pros and cons. Free. The most obvious and valuable benefit of free plans is, of course, being able to use a product’s offerings at no cost. Your credit card information is not collected and you can use the system as long as you want without commitment. Access to essential features. A free email marketing tool provides you with the essential features you need to start your email marketing campaigns. In most cases, they are also scalable so once your business and marketing demands grow, you can easily upgrade to premium plans in the same platform. No upfront investment. Signing up for a free plan is a good way for you to test the waters. You can test drive the system and its capabilities to see if it matches your workflows without making any upfront investment. Lack of advanced features. The features offered by different products vary—some include advanced features while others reserve it for their premium plans. You may need some features that are not in the plan such as A/B testing, autoresponders, spam filter diagnostics, and social media monitoring, among others. If so, it is more cost-effective to upgrade to an affordable premium plan that has the features you actually need. Limitations. Even though you can use free plans as long as you want, there are still limitations to its features. For instance, free email marketing tools commonly have a limited number of subscribers or emails you send per month or day. Subpar customer support level. Most free plans offer limited or no customer support. Vendors prioritize users who are using their premium plans, and understandably so. Hence, it’s important to consider that it may be hard to reach support when you have inquiries or issues with the platform. With that, let’s proceed to reveal the best free email marketing software tools. We compiled products that pack robust features and scalable solutions in their free plans. HubSpot Marketing is a popular marketing solution that is designed to streamline the organization, tracking, and nurturing of leads for campaigns. As a product of HubSpot, one of the industry’s most trusted platforms, you can ensure that it doesn’t skimp on features. Moreover, it goes beyond email marketing. If you want to start using its features, you can easily do so when you sign up for a HubSpot Marketing free app here. It lands on the first spot of this list as it has offerings that are only available on other product’s paid versions. For instance, the platform also comes with a robust contact management system that lets you segment your leads according to various criteria. You can also schedule and queue the delivery of emails to a prospect for a personalized sequence. Lastly, it allows you to reduce the time it takes to send repetitive emails by tracking their performance to know which campaigns are effective or not. In case you choose to upgrade to a paid version later on, you can start using this platform’s intuitive email builder, create automated campaigns, and even perform A/B testing on your email campaigns. HubSpot Marketing’s free plan is inclusive of contact form creation, lead capture pop-up forms, contact database creation, and traffic and conversion analytics. It can also integrate with your CMS, email, and form tools. HubSpot Marketing currently offers four paid plans depending on the types of features you need and the number of contacts you need to handle on a monthly basis. They have Starter, Basic, Pro, and Enterprise plans that cost $50/month, $200/month, $800/month, and $2400/month respectively. The vendor also offers add-ons that you can include in your monthly plan for a fee. SendinBlue is a platform that lets you easily manage transactional emails and marketing campaigns. Offering an email builder with drag-and-drop navigation, it allows users to build attractive, mobile-friendly emails without the need for coding know-how. It provides several options for transactional and autoresponder emails as well as responsive design templates, so you can easily pick a template for different purposes and simply customize them however you like. The platform also comes with features such as contact management, campaign creation and tracking, as well as email scheduling. To learn more about its features, you can sign up for a SendinBlue Email free trial here. In addition to its impressive features, SendinBlue Email comes with API functionalities that allow you to tightly integrate it with your existing systems or with new third-party applications. This way, you can be sure that you can configure it according to the changing needs of your email marketing efforts. SendinBlue Email’s free plan can support unlimited contacts and send up to 300 emails per day–that’s up to 9,000 emails per month. This is inclusive of its mobile-friendly email designer, email template library, and email and SMS personalization. SendinBlue Email currently offers three monthly plans: the Lite plan at €19.00/month which can support up to 40,000 email per month and has no daily sending limit; the Essential plan at Essential: €29/month which allows you to remove the SendinBlue branding and provides you with advanced statistics; and the Premium plan at €49/month which comes with landing page builders, unlimited automation workflows, and a send time optimization tool. They also offer an Enterprise plan which is only available by quote and comes with a dedicated account manager. Wix ShoutOut is a simple email marketing software built for small businesses. It simplifies how you build and share email newsletters using its email marketing tools, designer-made templates, and intuitive builder. This allows you to customize the email’s design by changing the color, text fonts, and backgrounds, among others. It also ensures your email campaigns will look good when viewed on any device as they are mobile-ready. Furthermore, it comes with a powerful mailing list management tool that makes it easy to segment your contacts and create targeted email marketing campaigns. You can also evaluate its paid features at no cost when you sign up for a Wix ShoutOut free trial here. It also has features such as contact integration, social media tools, and stats tracker based on your campaign’s open, view, and click rates. Since it’s a product by Wix, a robust website builder, Wix ShoutOut works best with your website made on the platform. At the same time, you can also subscribe to the product on its own. The Wix ShoutOut free plan lets you utilize all of the features the product has to offer. Ideal for small businesses and growing startups, this plan only includes a course of 3 ShoutOuts per month where you can send up to 5,000 emails. This resets every first day of the month. Zoho Campaigns, Zoho’s email marketing platform, is built to create, send, and track email campaigns for small- to medium-sized businesses. It connects with other applications of the Zoho ecosystem, hence, it’s wise to also include this product for your email marketing needs if you’re already using Zoho apps, especially Zoho CRM. It automates email marketing with permission-based access and personalized campaigns. Should you want to assess this product’s features further, you can sign up for a Zoho Campaigns free trial here. Aside from its powerful campaign creation tools, Zoho Campaigns also comes with a wide range of features that will allow you to fine-tune your email marketing efforts. For one, it has a recipient activity tracking tool and engagement measurement capability that will help you determine how your customers are interacting with your messages. Furthermore, the platform comes with built-in A/B testing functionalities so you can gauge the efficacy of your campaigns before you even roll them out. Zoho Campaigns offers a forever free plan that can support 12,000 emails/month for up to 2,000 subscribers. This allows you to use all of the features that the platform has to offer. The vendor currently offers two types of plans: the Pay-As-You-Use plan and the monthly subscription package. The former lets you purchase email credits according to the number of emails you expect to send. This costs anywhere between $6 for 250 credits to $750 for 100,000 credits. Meanwhile, the subscription plan is priced according to the number of subscribers you have. Prices for this may range from $5/month for 1 to 500 subscribers to $350/month for 50,001 to 100,000 subscribers. MailChimp is one of the most popular email marketing products of today, especially for small businesses. Known for its easy-to-use, no-code interface, this platform has a campaign builder that lets you easily craft emails that suit your message—whether it’s for a product launch or news announcement, for a start. Some of its features include email templates, in-suite apps, integration to e-commerce platforms, and campaign archiving, among others. To add to its stellar set of email marketing features, MailChimp is also trusted for its business-enhancing analytical technology. With it, you can learn who’s opening your messages, where they are opening it from, and how they are interacting with your emails. This is great for understanding the browsing behavior of your target customers and finding out what marketing techniques they respond to the most. With this, it is easier to improve on your campaigns in the future. MailChimp’s free plan, “New Business,” enables you to send 12,000 emails per month for up to 2,000 subscribers. This includes automation, built-in signup forms, report and data insight, and campaign creation without coding required. MailChimp only offers two paid plans: the Growing Business plan at $10/month and the Pro Marketer Plan at $199/month. The first one unlocks unlimited sending, email delivery by timezone, predicted demographics, and email and chat support while the second one comes with enterprise-level features that can support the needs of high-volume senders. MailJet is a Paris-based email marketing software that sends, tracks, and delivers emails for both marketing and transactional purposes. Passport, its intuitive drag-and-drop editor, lets you create email campaigns easily with free and responsive email and newsletter templates. What makes this great is that you can personalize the email and see how it looks like from the receiver’s end to ensure it’s well-crafted. Moreover, it integrates with REST and SMTP servers to guarantee delivery. This way, you can be sure that your emails aren’t getting lost or ending up in the spam folder. MailJet also prides itself for its analytics capabilities. It has a campaign comparison system that lets you develop campaigns based on previous performance and future performance forecasts. In a nutshell, it analyzes how your customers are responding to your campaigns, collects the data on click or view rates, and provides you with comprehensive reports that you can pull insights from later on. The MailJet free plan allows you to send 6,000 emails per month or up to 200 emails per day. This is inclusive of full API access, unlimited contacts, advanced email editor, and advanced statistics. MailJet offers some of the most affordable email marketing plans on the market. They have a Bronze plan starting at $7.49/month. It comes with all the premium features and can handle up to 30,000 emails monthly. They also have a Crystal plan that starts at $21.95/month that can support 60,000 emails, offers premium features, and comes with expert deliverability support. Next on our list is Mailgun, an email automation program built specifically for developers. Unlike the previous products on this list, this platform doesn’t offer drag-and-drop navigation, so it might not be ideal for users with minimal technical know-how. However, if you are looking for the complete flexibility to configure your campaigns and have IT experts by your side, this will be a boon for you. For one, it has an API-first architecture that is engineered for reliability. It also comes with a robust sending infrastructure and advanced email validation that lets you send transactional emails in bulk without worrying about them bouncing back or ending up in spam. Mailgun also comes with powerful tracking and analytics tools that let you access searchable logs and helps you remain up-to-date on the status of your email campaigns. You can even tag certain data so that it is easier to pull information for A/B testing later on. Mailgun has a free plan that lets you send up to 10,000 emails on a monthly basis. This is inclusive of all the features that the platform has to offer. Mailgun only starts charging users once they surpass the 10,000 email/month limit. For the next 500,000 emails, they charge $0.0005 per email. After that, the following 1,000,000 emails will cost $0.00035. Lastly, for the next 5,000,000 emails, they will charge $0.00015. Once you go over the 5,000,000 email limit, they charge $0.00010 for every additional email. MailerLite is an email marketing solution built for businesses of all sizes. It has a drag-and-drop editor, custom HTML editor, Rich Text editor, built-in photo editing feature, newsletter design templates, and file manager, among others. With this, both novice and professional users will find it easy to create emails, map out campaigns, and schedule messages. Moreover, it comes with an email statistics feature that will help you check essential aspects of your campaigns such as clickthrough rates, open rates, and conversion rates. This way, you can better determine how to increase customer engagement. Another thing that makes MailerLite a great email marketing solution is that it comes with a developer API function. This will allow users to easily scale the platform up or down depending on their current requirements. For your convenience, MailerLite may be deployed via cloud or on-premise. They also offer 24/7 support to help you make the most out of their platform. MailerLite has a forever free plan that lets you get limited access to the product’s features. With this, you can support up to 1000 subscribers and 12,000 emails per month. Currently, MailerLite offers subscription plans depending on the number of subscribers you have. This can support unlimited emails and provides you with all the features that the platform has to offer. Prices range from $10/month for up to 1000 subscribers and $50/month for up to 10,000 subscribers. FreshMail is a cloud-based email marketing service created for small and medium-sized businesses. It provides users with an intuitive template editor that lets you create emails and newsletters using drag-and-drop navigation or via HTML, making it great for users with limited coding knowledge as well as developers. It even comes with a wide range of industry-specific templates to accelerate the email creation process. In addition, just like other platforms, it offers robust automation options to help you make campaigns more efficient as well as real-time email tracking tools to give you an idea of your email marketing performance. What makes FreshMail different from its competitors is that it comes with clever autoresponders that let you auto-respond to customers depending on how they interact with your messages. Moreover, it has a spam test feature that helps you ensure that your email is free from content that might cause it to end up in the spam folder, ensuring deliverability. FreshMail has a forever free package that is inclusive of all the features that the platform has to offer. However, it can only send up to 200 emails monthly and support a maximum of 500 subscribers. The vendor currently offers unlimited email plans that are priced depending on the number of subscribers you want to support and pay-as-you-go plans that are charged according to email credits. For the unlimited email packages, prices range from $14/month for 1000 subscribers to $405/month for 100,000 subscribers. Meanwhile, the pay-as-you-go plans cost anywhere from $30 for 5000 emails to $1300 for 1,000,000 emails. Another award-winning email marketing tool that you can use for free is RedCappi. This platform provides small companies and medium-sized businesses with powerful features to streamline their email marketing process. It has a drag-and-drop email editor, custom email campaign creators, email schedule automation, and contact management tools. Furthermore, it provides users with real-time insights on your email marketing data so that it is easier to adjust your workflow. Optimizing your email marketing efforts aside, RedCappi also helps you leverage social networks to help you generate more leads. This way, you can improve brand awareness and customer loyalty. You can utilize RedCappi completely for free if you intend to support less than 100 contacts. This is inclusive of all the email marketing features including analytics and API functionalities. RedCappi provides plans that are priced according to the number of contacts you plan to enroll in the system. This can cost anywhere from $10/month to $1398/month and can handle 101 contacts to 500,000 contacts. For companies who need to accommodate over 100,000 contacts, a quote-based plan is available. An innovative email marketing tool, Email Octopus allows users to send out emails through the Amazon Simple Email Service (SES). It comes with powerful yet easy-to-use builders that can generate responsive HTML emails for time-based drip campaigns. Furthermore, this software solution is equipped with tools for bounce prevention and deliverability management so that you can make sure that your emails are reaching their respective destinations. Other notable features of this tool are its autoresponders, extensive image library, template management, and analytics. In case you are looking for other functionalities, this platform can also integrate with over 500 products and services through its developer API functionality. Lastly, Email Octopus is also fully compliant with the GDPR for your peace of mind. Email Octopus offers a Shrimp plan that is completely free of charge for businesses with only 2500 subscribers. It comes with campaign creation tools and other basic functionalities. It can also store your analytics information for up to 90 days. Email Octopus offers four affordable plans depending on the number of subscribers you have and the types of advanced features you need. You can opt for their Tuna, Stingray, Shark, and Whale plans that cost $19/month, $39/month, $59/month, and $109/month respectively. These all come with priority email support and can store your analytics information for as long as you need it to. Benchmark is a platform best known for its heavy-duty WYSIWYG email designer that can be navigated using a drag-and-drop tool. This makes it a good email marketing tool for time-strapped marketers who want to create visually stunning, responsive emails in just a few clicks. You can even edit photos right on its editor and add effects, stickers, and texts. Moreover, it allows users to streamline the creation of auto-responses, surveys, and polls and then let you preview your work via mobile or desktop mode. After rolling out campaigns, you also have the option to track your success using its real-time reporting features. Benchmark offers a free starter plan that can send up to 14,000 emails and can handle 2,000 subscribers per month. It has the drag-and-drop editor, responsive templates, signup forms, Google Analytics tracking, and basic drip campaigns, among others. The vendor also offers paid plans depending on the number of subscribers you need to accommodate and the number of emails you want to send. Aside from unlocking advanced features, only premium plans have access to Benchmark’s Automation Pro feature. You can choose from their Medium, Large, Extra Large, and Massive plans which are available at $21.99/month, $346.99/month, $758.99/month, and $4,800.00/month respectively. Pepipost is a transactional email solution offering best-in-class features at rates that won’t break the bank. Ideal for freelancers and small businesses, it comes with fast SMTP APIs, AI-powered email delivery, efficient bounce prevention, and reliable email tracking options. It also comes with powerful security features to help you safeguard your information. Additionally, Pepipost provides its users with a scalable architecture that doesn’t require you to maintain in-house servers to ensure the delivery of your emails. Meaning, you can save on maintenance costs even more. Pepipost has a forever free plan that can support up to 25,000 emails with a daily limit of 5000 emails. It comes with a single sending domain, live reporting tools, webhooks, SMTP, and email APIs. Pepipost offers a straightforward pricing package, Pro Plan, that costs $0.20 per 1000 emails. This includes SMTP and email APIs, live reporting options, webhooks and sub-user management, as well as 24/7 chat support. In addition, it comes with no daily limit on emails and no limit on sending domain. Express Pigeon is an email marketing solution built for usability and flexibility. It is great for marketers, freelancers, and business owners who do have limited technical knowledge as it comes with a responsive editor complete with a wide variety of templates for different purposes. The platform is also equipped with robust email scheduling, contact segmentation, and A/B testing tools that make it easy to plan effective and streamlined email marketing campaigns. You can even check the efficiency of your efforts by using the campaign reporting tool. Lastly, if you think that the platform doesn’t have particular functions that you might want for your operations, don’t worry. It comes with powerful API capabilities that let it integrate with some of the most popular business systems on the market. Express Pigeon is available for free if you only have 500 subscribers and process up to 1000 emails per month. This is inclusive of all the features of Express Pigeon as well as technical support. The vendor currently offers three paid plans that are priced depending on the number of subscribers and emails you want to accommodate on a monthly basis. Prices range from $9.99/month to $19.99/month and can support up to 2500 subscribers. Last, but not least, is an easy to use email marketing solution called Taximail. Mainly designed for bulk email sending, Taximail is a feature-complete email marketing platform that is armed with email automation and autoresponders to help you accomplish more work in less time. The software can automatically send email campaigns based on your specific parameters. You can have it send your campaigns based on specific events, schedules, or custom conditions. Taximail also helps marketers easily manage their email lists, segment their contacts, integrate with third-party applications and services via API, and more. More importantly, the software lets you track and analyze your email campaigns. With this, you are well-aware if your campaign was a success based on how many emails were opened, or if it even reach your target audiences. Mailupnext features a completely free to use plan that limits the sending quota, maximum campaigns, and maximum subscriber count to 1000, 20, and 1000, respectively. Paid options start from $29.99 per month up to $1,499 per month. Pricing affects the higher limit cap for the sending quota, subscriber count, campaigns, and file size. The more premium plans allow users to create sending servers, sending domains, and email verification servers. Segment Your Contacts. Out of all the email marketing tips that we can give, this is one that we believe bears repeating. Contact segmentation is crucial to the success of your email marketing campaigns as this is what allows you to create targeted emails. By organizing your mailing list according to particular criteria such as buyer personas, demographics, age brackets, or phases in the customer lifecycle, you can make personalized messages that resonate well with your customers. Hence, this allows you to improve the quality of your interactions and build better relationships with them. Utilize Drip Campaigns. In a nutshell, drip campaigns are a series of scheduled emails programmed to be sent according to set triggers. This lets you move leads through the sales funnel more efficiently and it allows you to engage strong leads at the most opportune time. All you have to do is define the triggers that will alert the system to send your messages. Some examples of this would be welcome emails for leads that recently subscribed to your newsletters, follow-up emails for leads that abandoned their carts, or thank-you emails for clients that purchased an item from your online store. These will allow you to forge relationships with your customers and keep them interested in what you have to offer. Use Interactive Content. Interactive emails allow you to capture the full attention of your target audience and increase their engagement. In fact, interactive content can boost click-through rates by 73% and it allows users to get three times more conversions than static emails. This is why as you construct emails for your campaigns, you should consider embedding infographics, videos, images, and surveys into them as this makes your content more interesting. Hopefully, with our list of 15 best free email marketing software, you were able to get a better idea of which platforms are most suitable for your operations. To conclude, we highly recommend HubSpot Marketing because it gives you the power to efficiently manage your contacts, create stunning emails, as well as monitor the progress of your email marketing campaigns. Moreover, it offers functionalities that go beyond email marketing. You can sign up for a HubSpot Marketing free app here if you are interested in this solution. What is the Best Email Marketing Software for Lead Generation?